“It is not law ﬁrms that are being “branded” here, despite what students think, but the law students themselves, creating an image of class and sophistication that legitimates their status while at the same time it persuades them that this is what “real law”—big city law, big money law—just is. Coffee House provides an opportunity for students to practice, develop, and get used to exercising all those skills of social capital that Bourdieu tells us will be essential components of their future career. On the one hand, then, Coffee House is a rehearsal in the deployment of the tools of social capital. On the other, it is a performance that demonstrates the students’ collective competence to the lawyers who observe it. In each case, the effects on students’ attitudes to law, and to their own futures, is not limited by whether or not they talk to the lawyers who are present, or if instead they “just come to have a drink.” The identity of students, individually and as a body, is being transformed and entrenched physically, subconsciously, and imperceptibly. Manderson, Desmond, and Sarah Turner. 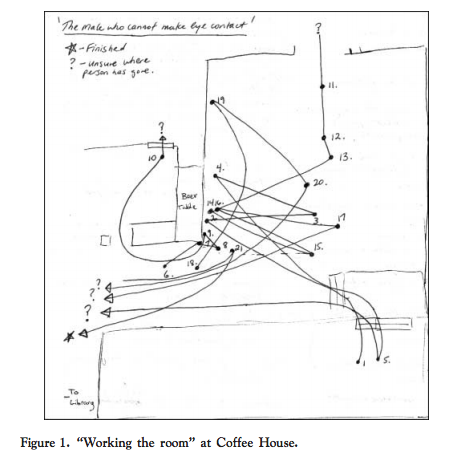 “Coffee House: Habitus and Performance Among Law Students.” Law and Social Inquiry 31.3 (2006): 649-76.